SureCoat Waterproofing Systems | "They make it white, we make it Watertight!" Waterproofing Solutions for the Complete Building Envelope! "They make it white, we make it Watertight!" Waterproofing Solutions for the Complete Building Envelope! Have you seen our latest roof repair video? YouTube it first here: http://ow.ly/zxiA308AauW – 2 min. cold weather flat roof repairs video. Maximize your Roof Coating Business in 2017 as a Seamless Single-Ply Approved Contractor! Even your installers can complete the process quickly without ever leaving the office. Real Value Inn and Suites of Tennessee saved 23,000 SF of roofing from landfills near the Memphis International Airport. Memphis, TN – What is a roof restoration system? When considering restoration of a commercial or industrial low-slope type roof such as a Built-up roof (BUR), there are key components that must be researched to ensure that you are choosing a true “roof system”. 1. Preparation – Clean the surface to be restored. Preparation is as much a part of a roof restoration system as it is painting a car or sealing a concrete floor. You must first clean the surface to be restored. Anyone who says you don’t have to clean the surface first likely has little experience with coatings or roof restoration systems. It is only a matter of time before a coating material will begin to peel and delaminate when installed over a dirty or oily roof surface. 2. Quality Products – A true roof restoration coating product will have a perm rating of less than 1.0. Anything higher than this is not considered waterproof. Moisture will permeate through a material with a perm rating of 1.0 or greater even if all the other steps have been completed thoroughly. The coating material should also have an elongation of 350-450% and a tensile strength of over 400 psi. 3. Reinforcement – Don’t disregard this step. Does it take a little labor, yes, but this is what makes the roof coating system an actual “roof system” and not just a roof maintenance painting to be performed every year. There are several types of reinforcement and not all are equal or have the same purpose. The purpose of reinforcement in a roof restoration system is tensile strength. This is not to be confused with fabric used to keep oil and water (emulsion and acrylic) connected. 4. Support – Customer service and installation support are as much a part of the roof system as the contractor installing it. Anyone can sell and ship you materials, but are they there when you call them for support while on the roof? A company that sells a restoration system and not just products will be able to offer you support because they are part of a team that offers you support through the installation of their roof system and not just sales representatives. Take it from the Real Value Inn and Suites in Memphis, Tennessee. 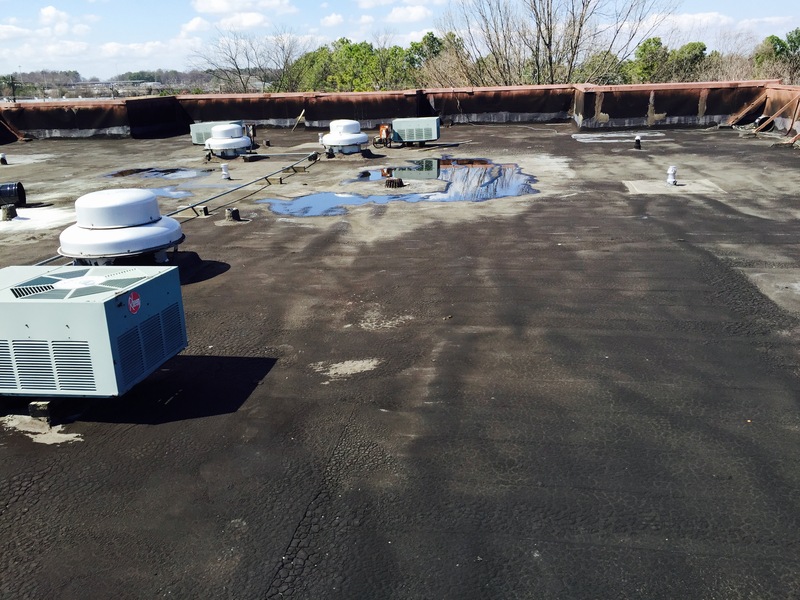 The Real Value Inn recently completed the installation of 23,000 SF of the SureCoat Roof System over a BUR. This hotel roof was leaking throughout at only 15 years of age. The winter of 2014/2015 had the owner of the Real Value Inn getting quotes for a new roof. Their many previous attempts to fix and repair the roof leaks with tar patches had failed and so Mr. Kaushal, General Manager and Owner of the Real Value Inn, sought out new roof alternatives. So why choose a roof restoration and not a new roof? The number one reason is to avoid the down-falls of traditional roof replacement. 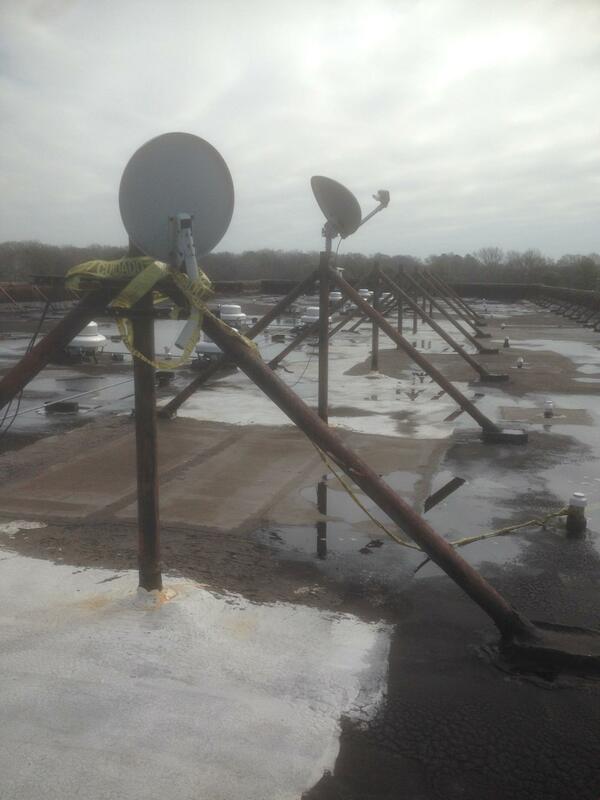 Eliminate seams, welding and the same roof leak issues encountered with the existing roof. Other costs eliminated with a roof restoration compared to a new roof installation are the expenses of tear-off, down time and disposal in landfills. There are hundreds of coatings on the market today but very few are recognized as roof restoration systems. The majority of these coatings are to keep UV off of an unstable traditional roof system. The main problem that we have encountered is that these reflective roof coatings are being sold as waterproofing or roof systems when there is no “system” to them whatsoever. When researching, evaluate the Technical Engineering Data testing. You will easily see that the ASTM and other testing results prove that they are in fact not waterproof at all. After having performed his research, the owner of the Real Value Inn decided upon the SureCoat Roof System. Being that the hotel was facing severe roof leaks due to freezing temperatures in the winter season, the SureSet option allowed this roof to be sealed and reinforced in a much shorter time period so that the business could continue to operate and rent out rooms to their new arrivals. Located near the Memphis International Airport, leak-free rooms and minimal down-time was of extreme importance to this family-owned business. When asked why SureCoat and not something else, Mr. Kaushal stated that he really liked the process and the material after trying it out and comparing the SCRS to other competitors products. You can find the Real Value Inn online at http://www.realvalueinn.com or contact the owner by emailing arun@realvalueinn.com. Questions or comments about this article can be sent to jamie@surecoatsystems.com. Please visit us online at http://www.surecaotsystems.com for more information about our waterproof roof restoration system or call us today at 877-823-7873. RCMA Announces its Merger with the Reflective Roof Coatings Institute. Please read the following and share with us the benefits of this organizations merge to your business in the New Year! WASHINGTON, DC (January 1, 2015) – The Roof Coatings Manufacturers Association (RCMA) and the Reflective Roof Coatings Institute (RRCI) have merged together into one industry association which will continue to advance, promote, and expand the national and international market for roof coatings through education, outreach, technical advancement, and advocacy. Bringing the two associations together will better position the roof coatings industry in the various legislative, regulatory, and building code development arenas that affect the two associations’ consolidated membership. The merger between RCMA and RRCI will result in a stronger, more unified voice for federal and state advocacy initiatives and a more robust communications and marketing program for roof coatings. In addition, the merger will result in a more detailed and comprehensive industry shipment report which will be a huge benefit to members. RCMA has made a number of changes to its committee and task force structure, including the creation of the new RCMA Reflective Roof Coatings Institute. Through the development of technical bulletins, case studies, white papers, and research, this institute will allow RCMA to be a tremendous technical and educational resource to the industry. A strong emphasis will be placed on outreach to the end-user of coatings products, so that RCMA can ensure proper and accurate information is available for their benefit. The RCMA Annual Meeting will be held in New Orleans, Louisiana on February 22-23, 2014, in conjunction with the International Roofing Expo. The programming, speakers, and topics featured at the RCMA Annual Meeting represent broad segments of the science, technology, and professional expertise on roof coatings. Registration for this meeting opens on January 5, and current RCMA members as well as non-members are welcome to attend. The association will continue to be called the Roof Coatings Manufacturers Association, with the existing logo and website. 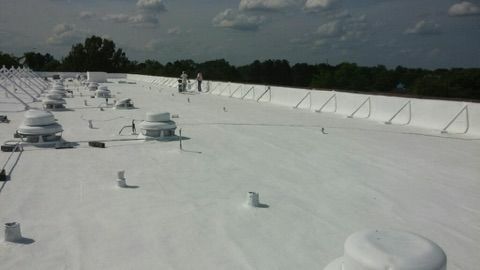 For more information on RCMA activities, programs, and initiatives, please visit us at www.roofcoatings.org. SHARE with us the BENEFITS of the RCMA & RRCI merge to your BUSINESS in 2015! Ever wish that you could work around the solar panels when installing a new roof? Any building owner with roof leaks or hail damage and a roof-mount solar system certainly does! Pioneer Roofing and Specialties, has been voted Las Cruces’ Best Roofing Contractor 5 years in a row by the readers of the Las Cruces Sun-News and I am guessing that their pioneering efforts like those seen on this completed SureCoat Roof System project are partly to blame! Mario Moreno, owner of Pioneer Roofing, and his crews have sold and installed dozens of SureCoat Roof Restorations this coating season throughout the city of Las Cruces alone! Mario has three crews and SureCoat roof installs booked well into spring of 2015. Just look at the perfection of this roof on the home of the Eric and Donna Johnson in the Horseshoe neighborhood of Las Cruces, New Mexico. Mario and his crew installed a complete SureCoat Roof Restoration while the Johnson’s solar system stayed in place on their roof! Eliminating removal of the solar energy system alone saved these homeowners thousands of dollars and the more panels on the roof, the higher the cost of disconnection and reinstallation. Look at this case study performed on the South Coast AQMD. The cost to disconnect and reinstall just one of their solar systems was estimated at $80,000. This roof turned out to be a Latent Hail Damage case which required a Forensic Specialist to diagnose. When originally inspected, the claim on this hail damaged roof was minimal only paying for a few damaged parapet wall areas. Concerned that they were in need of a more thorough evaluation, Mr. Eric Johnson, PE, both a Professional Engineer and practicing professor at NMSU, further pursued his claim with State Farm Insurance. It was then, that State Farm called in a Forensic Specialist from Colorado. Read more about the pioneering roofer of Las Cruces and the services their company offers here at Rooferllc.